South Africa’s solar process heat installations remain profitable when they have to compete against other heat sources, such as diesel, paraffin, petrol or gas, the Centre for Renewable and Sustainable Energy Studies (CRSES) at Stellenbosch University, South Africa, has concluded in a recently published paper. The researchers at the CRSES conducted a feasibility study of a 120.7 m² collector field that was to cover 60 % of the existing hot water requirements of Cape Brewing Company (CBC) based in Suider-Paarl, Western Cape, and analysed ten proposals submitted after the company’s invitation to tender in January 2015. South African E3 Energy won by offering an installation with a levelised cost of energy of 7.9 EUR cents/kWh, an internal rate of return of 16.7 % and a payback period of 9.3 years. CBC´s daily hot water demand is estimated to be 7,000 litres at 85 °C during 245 days a year, i.e., during a full year except for weekends, public holidays and two weeks of summer holidays. The system went into operation in November 2015 and the COO of CBC, Andy Kung, seems satisfied with the performance and the energy saving it offers. “The payback time of 9.3 years might be considered relatively long. But the IRR of 16.7 % is high, so one realises that for systems with low future risks like the CBC system, the IRR is actually a more realistic criterion for investment decisions than the payback time,” the CRSES researchers wrote. This IRR – which is based on an economic life of the system of 20 years achieved without subsidies – is significantly higher than the country’s current rate of annual inflation (6 %). Still, CBC did receive a 10 % investment subsidy from the Austrian Development Agency’s SOLTRAIN initiative – an amount which was not included in the calculations of the IRR or payback period. “Being in a country where the sun is available in abundance, it was pretty natural that we followed the path on solar process heat to further improve our production,” Kung confirmed in the project film available online. “We needed to have minimum interruption in our day-to-day operation and production,” he added and said that they had hardly noticed the adjustments. During installation, a locally manufactured 10,000-litre storage tank made from stainless steel as well as a heat exchanger station were lifted in through the roof of the production facility and placed next to the brewery equipment. Then the 12 large collector modules (10 m² each) from Austrian manufacturer Greenonetec were put onto the roof before being mounted on a metal support structure. According to Doran Schoeman, Director E3 Energy Group, it was the first project in South Africa to install large-scale collectors. In contrast to standard versions, these large-scale elements have higher diameters along the header pipes to reduce pump power demand if a large number of collectors is connected in parallel. A unique feature of the solar process heat plant, according to the short film, was the heat exchanger station with circulation pumps run at variable speeds and the advanced control feature, which enables E3 Energy to sign into the system, check day-to-day performance and influence the settings. Averaged component cost shares from an evaluation of all CBC tenders. 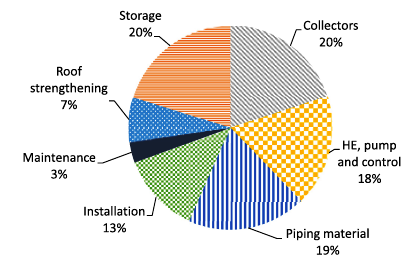 The relatively high price for pipework (19 %) was a result of the great distance between collector field and storage, the stainless steel requirement on the charging side, as well as the demand for cladding to decrease insulation wear and improve the look of the system. The above-mentioned CRSES paper analysed the ten submitted tenders and found a factor of 2.5 separating the specific cost of the cheapest (586 EUR/m²) from the most expensive proposal (1,484 EUR/m²). This indicated that “the market and/or the competition for large-scale solar thermal systems is not well established in South Africa.” The average specific cost of the winning offer were 832 EUR/m² of collector area, requiring an investment of EUR 100,339. Link to the paper Large-scale solar water heating in South Africa: Status, barriers and recommendations in the Renewable Energy journal.